ObsDB is experimental database software that I took part in developing. Its goal is to manage observational data through the use of ontologies. This paper was written for the Semantics of Biodiversity Workshop as a part of the EWSC Conference. The full paper can be found here. 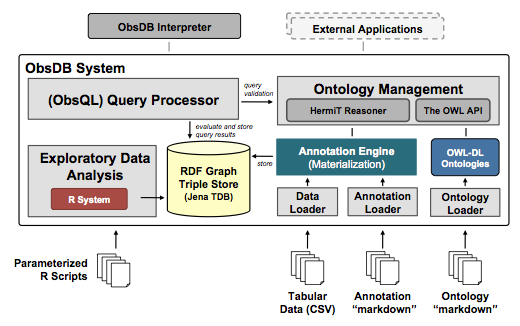 We describe recent ontology and annotation editing capabilities to a specialized data management system for observational data. The system supports observations and measurements explicitly, allowing users to upload observational data sets as well as semantically describe and query data sets using formal OWL- DL ontologies. Recent extensions allow users to extend observational ontologies with domain-specific terms as well as provide detailed semantic annotations using a “markdown”-based approach. In addition, we describe a new implementation of the system using standard semantic web technologies for managing OWL-DL ontologies and RDF triples. Our approach supports a wide variety of observational data, and is especially targeted at helping scientists manage heterogeneous biodiversity and ecological data by allowing access to data through a common and generic observations and measurements data model.